From the Cotswolds valleys to the Yorkshire moors, stone roofs represent the character of the British landscape. So much so, that a house with a badly laid roof, or one using the wrong roofing materials for the local environment stands out a mile – and not for the right reasons. Whether laying a new stone roof or reroofing an old, leaking roof, it’s better to understand some key issues at the beginning to avoid expensive problems later on. If properly laid and maintained, total re-roofing with new slates should not be necessary. Traditionally, blocks of stone were laid out in fields to be split naturally by winter frost before being dressed to size and shape, with a hole formed for the peg. Due to time pressures, they are more commonly split manually using a hand tool. Some suppliers offer sawn slates, these are often visually unacceptable (as they lay too flat) and can cause technical problems. Traditionally split slates are always preferable. Wherever possible, new stone slates rather than second-hand ones should be used. This helps to keep stone tile quarries open and reduces the pressure of theft on our existing stone roof stocks. If you are using second hand slates check where they’ve come from; it’s illegal to use salvaged tiles from another listed building. Having sourced your stone tiles what next? Find a roofer – but beware, not all roofers can lay traditional stone roofs. For instance, natural stone roof tiles should be dressed to size, not sawn, an angle grinder shouldn’t be used to cut them. Experienced stone roofers will ‘dress’ a slate with a chisel edge hammer or similar tool and will understand that if a stone tile is damaged, it may still be dressed to a smaller size and reused further up a roof where the battens are laid closer together, which makes it an extremely sustainable roof material. Look carefully at a stone roof and you’ll notice that there’s a real art to how it’s been laid. The lower stone tiles are much larger than those further up the roof (referred to as ‘diminishing courses’). On stone roofs, only half the stone tile is visible. 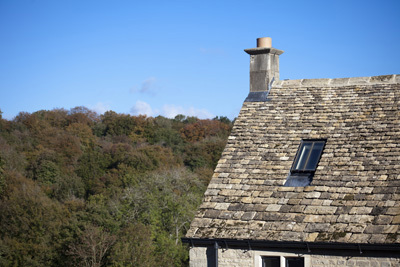 An inexperienced stone roofer may try and reduce the amount of stone used (thereby saving some money), but good horizontal and vertical laps are essential with stone, which unlike slate, does not rest flat against the battens, and therefore needs more coverage to ensure a watertight roof. When repairing roofs, salvaged slates should be laid in their original orientation, because if the hidden, unweathered surfaces are exposed they will deteriorate much quicker. Traditionally, stone slates were fixed with timber pegs (usually oak) hung over roof battens. These days, it is more common to use large headed copper roofing nails. Don’t be persuaded that your roof needs fascia or barge boards by a roofer either; traditional vernacular stone roofs don’t usually have them, unless they are a Victorian interpretation. Some of our clients want to replace an existing slate roof with stone because it looks more beautiful. If it’s a listed building you probably won’t be able to do it, and even if it isn’t, I would often caution against such action as the materials used on a roof will go a long way to explaining the history and phasing of the building. However, if you do go ahead, it should be checked by an ecologist for evidence of bats before the roof covering is disturbed; it is illegal for anyone to disturb, injure or kill a wild bat or obstruct access to a bat roost. If the roof has never had heavy stone on it, a structural engineer will need to be consulted to assess whether or not it can bear the extra weight. Having read the above, you will realise that you may not need the upheaval and expense of the wholesale replacement of a stone roof. So how can you prolong its life? The easy answer is to prevent moss build up. 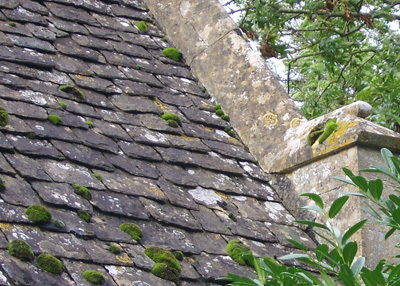 Moss will absorb moisture and accelerate the delamination of the stone slates, so scraping off moss, ivy and other creepers will help reduce the cost of future repair bills.